Although many of us may know little about James K. Polk, the 11th president of the U.S., 55 historians rank him as one of our “near great” presidents in a class with Theodore Roosevelt, Grover Cleveland and John Adams--that group preceded by only six designated as “great” presidents. Without Polk’s foresight we would not have the major part of the American West because he wrested the Oregon region from England and he fought an unpopular war with Mexico to obtain Texas, California and the rest of the Southwest. He ran for the presidency with those goals, and when he accomplished them, he chose not run for a second term. The presidential home site in Columbia, Tenn., consists of his sister’s and parents’ homes and a nearby Presidential Hall that features changing exhibits about his life and times. We started our tour at his sister’s house which includes the visitors’ center with a film about his life. Because he had been a sickly child, he went to the University of North Carolina to be educated for a non-physically demanding professional career. Early in his career as a lawyer he became a close friend of Andrew Jackson and helped him win the presidency. His wife Sarah Childress, who had had an advanced formal education rare in those times for females, played an important role in his career serving as his private adviser in his roles as congressman, governor and president. At the time we were visiting in May, the Presidential Hall was featuring an exhibit about her remarkable life. The Polks entertained frequently, and she made it a policy to serve one food item at a time ensuring relaxed long dinners where major issues could be fully discussed and friendly relations established among the participants. 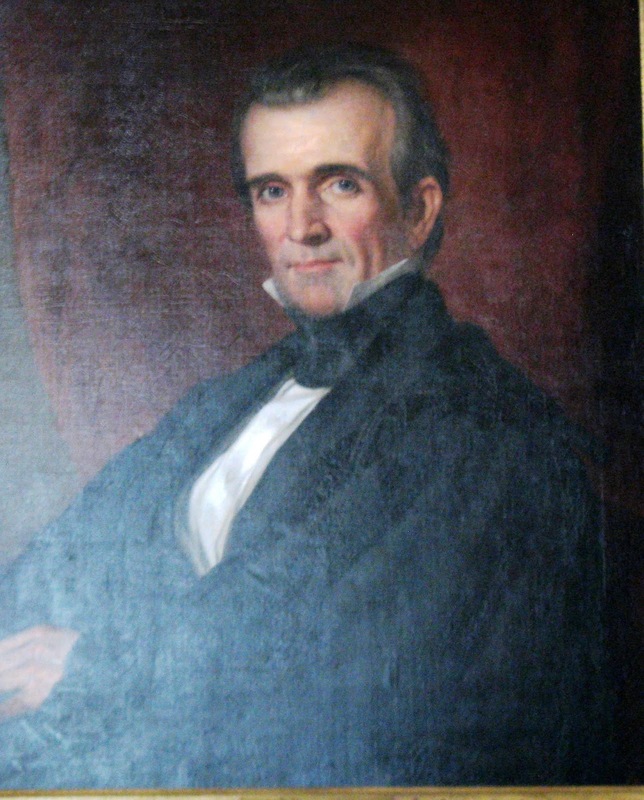 Polk served seven terms in Congress, and in 1835 was the Speaker of the House, the only president to serve in that capacity. However, he was not well known and was only entered in the presidential campaign as a dark house when the nominating convention was deadlocked after eight ballots. Polk was nominated when the former President Martin Van Buren withdrew and put his support behind Polk. His opponent for the presidency was the well known Henry Clay, and Polk won by the fewest popular votes of any president. Besides gaining possession of the West for the U.S. he established the Naval Academy at Annapolis and the Smithsonian Institution, and negotiated with Great Briton for reciprocal rights on the high seas. He also reached his goals of reducing the tariff and establishing an independent treasury. The family home has a collection of items from Polk’s parents, personal belongings of James and Sarah Polk including artifacts from their years in the White House. After her husband died, Sarah moved to Polk Place in Nashville and some memorabilia from that period is also on display. Among the family pictures is one showing Polk just as he begins the presidency and one toward the end. The obvious aging is remarkable. He died three months after leaving the presidency in June of 1849 at the age of 53. 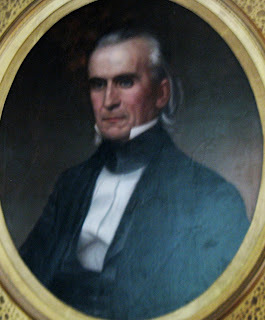 James Polk when he began the Presidency in 1845.